Eric Ythier has just published a synopsis of the scorpion fauna of French Guiana. In the paper, four new species are described. *The genus Auyantepuia was synonymized with other genera by Soleglad & Fet. 2005. Lourenço & Qi (2007) and Eric Ythier have chosen not to accept this synonymization, and described the new species in Auyantepuia, but no justifying the revalidation of the genus have been provided. The taxonomy of The Scorpion Files follows Soleglad & Fet (2005), but it is impossible for me to know where to put the new species. I have chosen to reinstate Auyantepuia in The Scorpion Files for this species until a new revision on the family Chactidae is published. Auyantepuia is not counted in the number of genera for the family, but the species are included. The articles has habitat description and pictures. The species list for French Guiana is updated and an identification key for the 30 species in the country is provided. A synopsis is provided for all scorpion species collected in French Guiana, including thorough diagnoses and additional distributional records for each documented species. Four new species are also described in this paper (one Ananteris from northeastern Guiana, two Auyantepuia from central and northeastern Guiana and one Hadrurochactas from western Guiana), raising the total number of species described from French Guiana to 30. Most of the species are illustrated, geographical distribution maps are presented, and a key to the species is proposed. 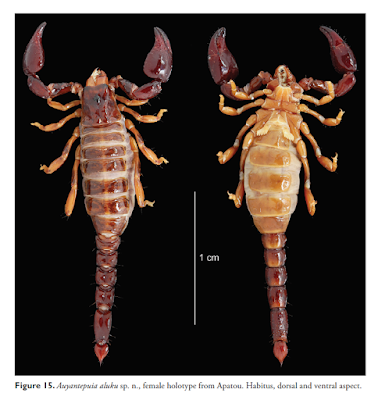 Ythier E. A synopsis of the scorpion fauna of French Guiana, with description of four new species. Thanks to Eric Ythier for sending me his article!